When you walk out of the Älmhult train station, there’s not much to see. To the west is a string of filthy box cars on the railroad, and to the east, a small park with no people. TripAdvisor will tell you that there is only one thing to do in the tiny Swedish village: Go to IKEA. Älmhult is the birthplace and global headquarters of the flatpack furniture empire. IKEA had flown me to Sweden to attend its second ever Democratic Design Day. The event was an opportunity for IKEA to show journalists around the world a highly edited depiction of its unique corporate culture and its latest products. The company put me up in the IKEA Hotel, paid for my meals, and gave me IKEA Beer. Every IKEA store creates the sensation of standing on the threshold of a world where there is nothing but IKEA. It’s an engaging possibility to consider for a few hours on a Saturday—an idealized existence, with every need met by a utilitarian-but-not-too-utilitarian product. Nearly every piece of furniture I’ve ever purchased, I’ve purchased from IKEA. It’s so cheap! I recently bought a mid-century modern-inspired sofa for $500. Crate and Barrel sells an almost identical sofa for $1,700. But here was that retail fantasy come true, in full. With a couple hundred other journalists, I spent 27 hours in a place where IKEA really was everything. Over those hours, my eager anticipation gradually gave way to a spooky dread. You walk away from a day at an overcrowded IKEA store with a low-grade generalized anxiety and a nice new bookcase. I walked away from IKEA headquarters questioning my very existence. The air was cool and charged, like sundown on Halloween, as I headed straight for the IKEA Hotel. This low-slung and slightly dirty building stands across an eerily empty parking lot of the original IKEA store. There’s an IKEA Museum in the basement of the IKEA Hotel, and all of the signs look just like the signs in the store. Nearby, a construction site near the original warehouse space was littered with tarps made out of the same blue plastic as the iconic IKEA Frakta bag. The signs seem helpful, but really, they’re not. The company produces attractive home goods at low prices, but there’s something strange happening in Älmhult—something dark. We had arrived in Älmhut by way of Copenhagen. I’m not very good at jet lag so I felt like a bit of a zombie by the time we dropped off our bags at the IKEA Hotel just before lunchtime. We didn’t have time to check in or nap. We deposited our luggage in an overcrowded closet and stole a peek at the lobby area cluttered with bright green swivel chairs from IKEA’s Stockholm collection. The event was starting immediately across the parking lot in the original IKEA warehouse, where IKEA executives would deliver keynote speeches. I couldn’t wait. I’ve always wanted to know how IKEA does it. The more time I spent at the headquarters, though, the more I felt that creepy feeling tickling my neck. (I’m not the first one to feel the creepy vibe, either.) IKEA presents itself as this growing globe-spanning empire with a deeply utopian vision. But IKEA is no utopia. Another journalist on the trip compared the experience in the IKEA Hotel to an overnight in a white collar prison, and I thought it was a good metaphor. It’s not as nice as it looks. Like the rough mass of shredded wood and glue under the smooth veneers, behind all those tidy flatpacked products is a messy global supply chain and an often embarrassing corporate history. Despite its aggressively happy-family branding, the company has a dark past filled with Nazis, forced labor, espionage, sexism, and environmental destruction. It wasn’t that I saw this history repeating itself on the corporate campus. In fact, IKEA employees were very, very eager to tell us that they were saving the world somehow by installing solar panels on top of stores or hiring basket weavers in Vietnam to make products. It was hard to believe that’s really the case. Much as you might in an IKEA store, we ate in a cafeteria before the first event. The space looked pretty much just like a store cafeteria except there were no windows. IKEA fed us new IKEA Meatballs that didn’t contain meat—not even horse meat. We drank new fruit-flavored IKEA Soda (pear is the best). We sat at country-specific tables and gossiped about which other country looked the coolest, just like in high school. After our IKEA Lunch, IKEA employees wearing color-coded lanyards directed us to the first event, a series of presentations, ostensibly about the company’s future. (We journalists also had to wear color-coded lanyards—mine was red.) While it seems like any old assembly area, the keynotes actually took place in the original IKEA warehouse. The bright yellow stage and perpetual smiles on the faces of the IKEA executives gave the whole thing a circus atmosphere. For what felt like hours, overly cheerful Swedish men jumped through hoops. They spoke in slightly accented English about IKEA’s values—a lot—and one man went to great pains to prove how IKEA was focused on sustainability. “It’s as easy as 1, 2, 3!” he said. 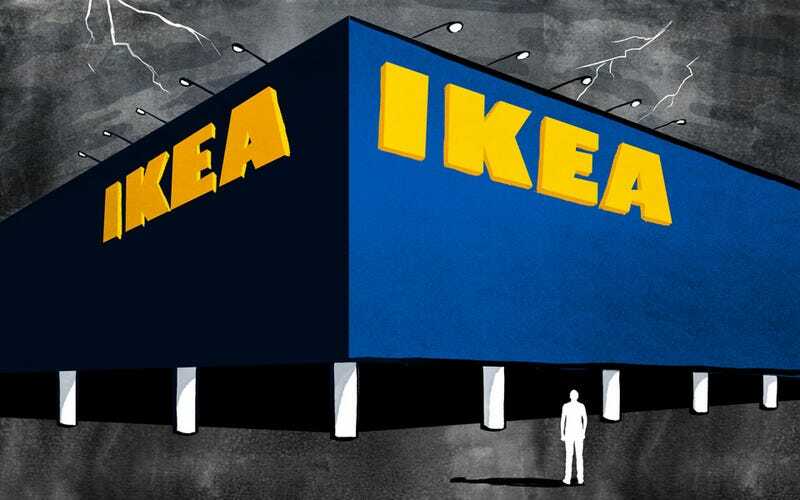 IKEA’s head of design, Marcus Engman, admitted that he often looks angry when he speaks. During these keynotes, I learned that the company is obsessed with logistics. I learned that the designers try to make sure that their furniture fit in those flatpack boxes without any extra air. Air takes up space in a shipping container, space that could be occupied by a product. I also learned that designers often start with a single component, like an especially efficient hinge, and design entire collections around that hinge. (They didn’t tell us which collection.) This sounds insane to me. But is it insanely brilliant or just plain bonkers? It’s certainly working for IKEA’s bottom line. Only one woman walked out onto the stage. She talked about how to raise kids. To be perfectly precise, one of the male executives asked her a bunch of questions about “play,” speaking to her like a child the entire time. “Play” was something that adults and children should embrace in every aspect of their lives. IKEA, she said, is a family-focused company, and I thought about Småland, the store daycare area. I had trouble understanding what she meant by “adult play” but nodded along. This is when I started to feel uneasy about this whole event. After the applause and some backslapping on the executives’ part, we were allowed to wander around. These hours even more bizarre than the first because everything felt especially uncanny. I was led around a dark corner, past a funhouse mirror, and up a long ramp. Half-expecting to walk into an arena filled with a jeering crowd—a recurring nightmare of mine—I entered a replica IKEA store. It’s not an exact replica, though. There’s no maze to force visitors to wind their way through the immense showroom: just IKEA product after IKEA product after IKEA product. The hippodrome of home goods appeared to contain every item that IKEA sells. Do they always make the beds so neatly? Is the caution tape always so neatly designed? There were IKEA employees sprinkled about in case we had any questions. I talked to one hip-looking designer about stoves. She wore all black and a furrowed brow. She seemed nervous, like me, but offered a curious insight into the design process. IKEA designers combine conventions in order to appeal to a global customer base, although she did admit that they made stoves bigger for Americans. I complimented the clean aesthetic of some stoves, and she directed me towards the latest induction stovetops, which use less energy, and blend into its surroundings. (As nice as the sales pitch sounds, I personally prefer to cook with fire.) Eventually, IKEA hopes to build the heating elements directly into the countertop. Doubles as a cutting board? IKEA stopped using that serif font in the early 1990s. I got lost again. The office building split into two wings, separated by a workspace that looked like a set from the IKEA catalog with recognizable IKEA furniture designs carefully arranged in communal spaces. I saw corporate buzzwords like “Customer” and “Excellence” printed on the carpet, faded from the trampling of thousands of footsteps. I passed countless empty conference rooms filled with IKEA office chairs and tables. I found the employee break room which bizarrely offered multiple rows of microwaves built into the wall. There were at least 30 microwaves in one small room. Did the workers eat some sort of special food? Eventually, I found the strange science fair of an event that was this designer meet-and-greet. The IKEA designers stood in makeshift booths that were littered with their latest creations, anything from decorative glass objects to those baskets woven by poor people in Vietnam. It almost felt like we were going to vote on a winning booth at the end of the event. (We didn’t.) I took a peek at IKEA’s new smart home system and checked out a sofa made of paper. There was a lot of talk about sustainability and how IKEA’s working with craftspeople in the developing world. I wasn’t sure what to think. Time was running out, so I struggled to find the exit. It was time for a party back in IKEA’s old warehouse filled the 250 or so international journalists attending the event. They would be serving two types of IKEA Beer, one light and one dark. With the keynotes over, we got a better look at IKEA’s original storage space. It was appropriately barren with cold, hard floors and little on the walls. The space had been decorated with IKEA products and IKEA furniture was scattered about rather randomly, not unlike the motley collection in the “As Is” department at the store. A long bar led to a DJ booth, where a young blond woman was playing vinyl. About three IKEA Beers into the warehouse party, some of the other journalists in my group started to gossip. They’d left the all of the lights on, so there was a high school dance vibe happening. It almost felt like we’d snuck under the bleachers to trash talk our teachers. “This place gives me the creeps,” one woman from New York said. I believe this is there for the employees. The DJ was playing a lot of Swedish House Mafia (not a joke), and the drinks were running dry, so we decided to head back to the quiet IKEA Hotel Bar. It’s right next to the IKEA Restaurant and just above the IKEA Museum. I snatched an IKEA Beer for the road, but the security guard took it from me. “You can’t take this out of here,” he said. I surrendered the bottle and stepped out into darkness with my new friends. There was a full moon that cast shadows on the wet sidewalk. Walking across the empty parking lot to the hotel, I caught another chill. The IKEA Hotel Bar was strangely just an extension of the check-in counter. We sat in the green swivel chairs from the Stockholm collection, but we didn’t stay long, because the bar closed after our first round. So we went to bed early, exhausted. Thanks to my irritable jet lag—and the 4 a.m. Swedish sunrise—I was up early. Wide awake in my spartan IKEA Hotel Room, I started thing hard about why this place felt so creepy. I’ve never been to a white-collar prison, but something about the hotel reminded me of a mental hospital. It was so cold. A renovation was underway, but I wondered why IKEA ever decided to decorate its name-brand hotel with cheap institutional tiles and tables nailed to the wall. It all felt so sterile. I recognized the red chair as an IKEA design, but I don’t think the company sells it any more. The only thing stranger than the IKEA Hotel was the IKEA Museum. I wrote a full post about that experience. I bought a miniature Billy bookcase in the gift shop and longed for home. The next few days were kind of rough for me. I felt more anxious than usual. I also felt uneasy sitting back on my new underpriced IKEA Sofa and eating out of my wonderfully designed IKEA Bowls with my affordably elegant IKEA Flatware. I didn’t sleep well in my IKEA Bed. My IKEA Dresser broke, when the bottom fell out of a couple drawers. I cursed at it. This is when things got really existential. I’d been writing stories about IKEA based on the new products I’d seen in Älmhult, and they’d led me into some of the darkest corners of the company’s past. A few years ago, its great leader, Ingbar Kamprad, admitted to being involved in the Nazi party during the 1940s, when he founded IKEA. He’s since also apologized and asked forgiveness for his “stupidity”. The employee cafeteria doubles as an employee auditorium with stadium seating. It makes you wonder if that same stupidity led the company to use forced labor to manufacture furniture in East Germany during the 1970s and 80s. Was the stupidity excuse also at play when IKEA Photoshopped women out of catalogs bound for Saudi Arabia a few years ago? This was around the same time that IKEA was clear-cutting ancient forests in Russia. Was my cheap couch made out of wood from a 600-year-old tree that should’ve been protected against the chains of the company that uses one-percent of the world’s commercial wood supply? I knew about all of these things before I went to IKEA’s headquarters, and I knew most of them before I bought an apartment full of IKEA furniture. That said, I’m pretty sure that latent knowledge is part of why I felt like there was a ghoul following me around that corporate campus. I guess I’ve always felt a little bit guilty about buying IKEA furniture, not just because I worry about the workers producing impossibly cheap goods or the environment that IKEA inevitably impacts. I feel guilty because it is a gargantuan corporation that’s helped a one-time Nazi sympathizer amass one of the world’s biggest fortunes. Ingbar Kamprad is famously frugal and reportedly lost most of his fortune a few years ago. (Some say it was a tax dodge.) I don’t really think I’ll ever forgive him for his youthful stupidity, though. And I’m not sure I ever want to shop at IKEA, again. This is the intersection of IKEA Street and IKEA Street. Just because I don’t want to do something doesn’t mean I’m not going to do it. Like I said before, IKEA’s sold us all on a totalizing vision of great design at low prices. It’s hard to start spending $1,700 on something you know you can get for $500 at IKEA. Despite my knowledge about the company—and despite having breathed the creepy air in its headquarters—I feel like I can’t escape the cult. I have Stockholm syndrome. So I keep an IKEA shopping list for my next furniture upgrade. Most of the items are from IKEA’s Stockholm collection, which is also its most lauded and most expensive collection. I wonder when I’ll save up enough money to buy the thousand dollar bed frame, a gorgeous piece crafted out of wood and leather. I’m thinking of buying one of the walnut-colored Stockholm chairs soon. The IKEA website says that the chair’s “softly curved back” give it “a warm and welcoming look.” I almost can’t wait to try it out in the showroom. I could start shopping at Crate and Barrel or its hip younger sibling CB2. I could start buying from local craftspeople. There are plenty of vintage and handmade furniture operations in Brooklyn. I could be a socially responsible individual. I could stop shopping at IKEA, and you can, too. But I haven’t. I returned to IKEA last Sunday planning to buy one thing: a full-sized bookcase. Three hours and several hundred dollars later, I walked out with a Billy bookshelf, a rug, a chair, a box of flatware, a duvet, a duvet cover, two pillows, a set of sheets, a towel rack, a towel, a broom, a dust pan, and a trash can. I pulled a muscle dragging the crap up the stairs and bruised my knees building the furniture. In spite of the suffering—and the history of suffering—I’m scared by how much I like my new things.